Yeah, it costs money, and I know you're supposed to be able to get all the info you need for free on the internet, but here's the deal: while there IS a lot of good information on it, there is also quite a bit of erroneous and/or incomplete information there as well. If you don't have a good "Ignorance and BS" filter installed on your computer, you can be led down a lot of wrong paths. Although working with kydex is easy enough to do, it is also easy enough to do badly. "The devil's in the details" as they say, and the details are in the DVD set and Workbook. What I did with the DVD set and workbook was to explain some principles, lay out some guidelines and safety procedures, then walk you through four different projects (tool holster, magazine carrier, knife sheath, and IWB pistol holster) that after completion, should have you pretty well grounded in working with kydex. Also show how to build your own kydex press and give you a design that can be used to hold straight walled items that don't have good "locking" shapes, such as pistol magazines and many multi-tools. It's a blueprint for success. Using my design pattern and a 1 sq.' piece of kydex, you can make 4 items that routinely cost $25-$40 each. The DVD set will pay for itself! I have yet to have anyone say it was NOT worth the money, and many who have said it was. You can get it from www.TRSDirect.com (559-732-5317; 1- 800-899-8153). http://www.trsdirect.com/KK-77.html (Ad's a little bit "over-the-top", but that's TRS's style), but if you buy the set directly from me, you can always ask questions and use me as a troubleshooting resource. * "Mike Sastre is the King of Kydex. All of his rigs are made using a minimal amount of Material. The operator can get a full hand grip on the knife handle on the draw.There is no need to readjust your grip after unsheathing. The blades "lock" into his sheaths,yet can be brought into play in a split second.This is an artform." "Anyone can make a holster or knife sheath out of Kydex. Mike's Dvd takes the years of experimentation out of the process.It is very rewarding to wear a carry system that you crafted by hand." * "Mike's DVD does not cost money , It saves money. Using the easy to use instructions and referring to the handbook as needed I made a holster and mag pouch for my Colt officers model that serves as my every day carry. Just this combination would exceed the cost of the DVD. The upside is the satisfaction of using a rig that you custom made yourself and tailored to fit . 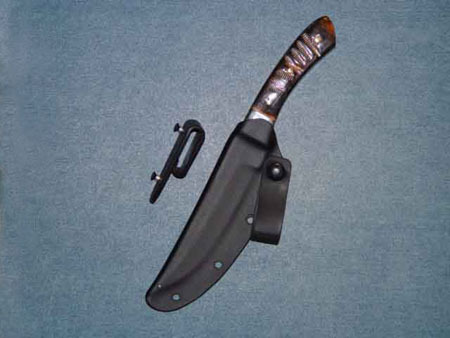 i also made sheaths for some knives and multitools that I had." * "Here is a big thumbs up for Mike Sastre's video set. They really are worth watching. I have made literally thousands of sheaths and recently watched them and learned a bunch of useful stuff." * "I wear my bowie all the time in Mikes' rig and no one is the wiser. Why carry a 4 inch blade when I can carry 10 1/2" just as easily. His video set is also top notch for anyone wanting to do their own kydex. If a dummy like me can do it, anyone can." * "I wanted to send a thank you for your follow-up help and advice on my implementation of your instructional video, "Kitchen Kydex". 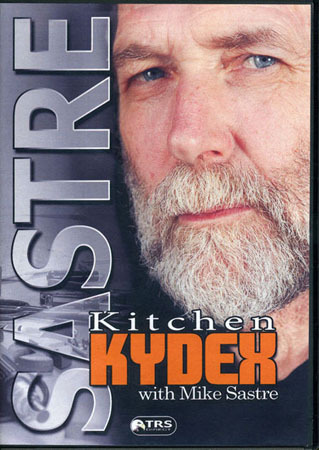 I purchased the "Kitchen Kydex" product two weeks ago and I have really enjoyed working with it. The flow of the teaching process is very good. When I saw you form a useful sheath for a Leatherman tool with a pot holder, it not only made me realize that you could work with minimal equipment, but the simple application of heat and pressure was very basic and I could understand better how the woodworking vice you showed next was actually working. I went to Lowes and bought a woodworking vice for like $25.00 or so and I've been making stuff ever since. I like the fact that I can use your vice design both vertically or lay it over on its back and use it horizontally. I use it both ways for different purposes. I was pleased with your quick email response to a couple of questions I had with my first efforts with the vice. Your customer service is first rate. I have never worked with Kydex at all. I have bought some holsters from BladeTech and know they are pretty expensive. With no prior experience, I have made two very functional holsters for pistols that I carry concealed. My Kahr PM9 holster is very easy to conceal. I made a concealment holster for my Walther PPK that is also easier to conceal than other holster solutions I have seen. Yesterday I made my third holster for a Walther P38 and a sheath for my wife's cell phone from an adaptation of the Universal pattern you show in the video. I have simply followed your instructions and my very first creations were far better than I ever imagined I could make. I have attached some photos of my work. I am getting more serious about a possible business opportunity with this as I find I'm really enjoying the process of making things that are really useful and that look great too. Thanks for a great training video,"